Massachusetts Sen. Elizabeth Warren is throwing her support – and fundraising prowess – behind California Attorney General Kamala Harris, who is running in what could be a crowded Democratic field for the California Senate seat being vacated by Sen. Barbara Boxer. Kamala Harris, California’s Attorney General and longtime friend of Pres. Obama is expected to announce her bid for Senator Barbara Boxer’s Senate seat. NBC Senior Political Director Mark Murray joins host Alex Witt to discuss. “Yesterday, she announced her candidacy for the United States Senate, and I’m happy to support her campaign,” Warren continued, before making a fundraising plea. The senator said she’s hoping to raise $25,000 for Harris’ campaign “right now” and links to a fundraising page. ”You and I know all too well what happens when you stand up to the big banks – they fight back with everything they’ve got. Let’s give Kamala the grassroots support she’ll need to stand up to the powerful interests. Become an early supporter of her campaign,” Warren wrote. 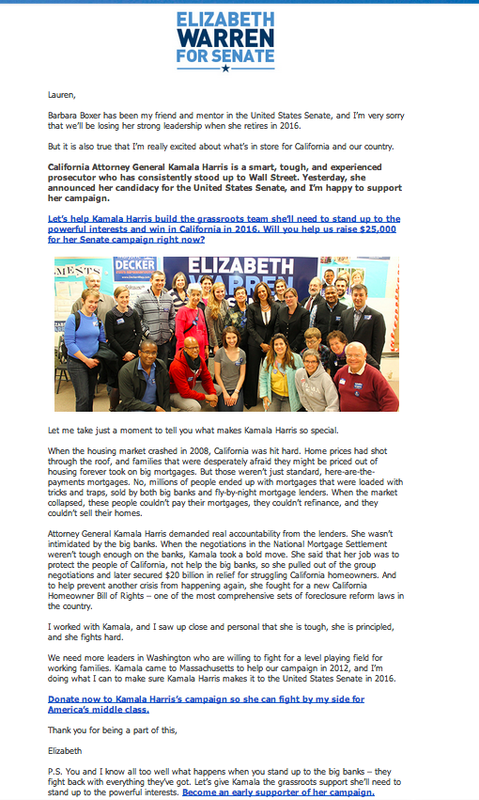 Her email goes on to lay out in length the work that Warren and Harris have done together to protect consumers and combat mortgage abuse, and expands on why the liberal darling is supporting Harris. In a state that leans heavily Democratic, the boost from a senator who has excited many in the progressives base could be a major bonus for Harris’ prospects. And she’s just the latest national Democrat to coalesce behind Harris. On Tueday evening, New Jersey Sen. Corey Booker tweeted that he was “So Excited about @KamalaHarris campaign for California US Senate seat,” encouraging his followers to visit her website. New York Sen. Kirsten Gillibrand also offered some words of praise, tweeting that she was, “Excited to see @KamalaHarris announce she’s running.” Gillibrand also retweeted a tweet from Harris linking to her campaign website. The Democratic Senatorial Campaign Committee, strongly signaled that they’re supporting Harris as well. “With strong candidates like Kamala Harris Democrats remain confident that we’ll hold this seat and continue Barbara Boxer’s long history of fighting for California,” spokesperson Justin Barasky said Tuesday. And EMILY’s List, the powerful pro-woman Washington Democratic group, sent an email to supporters saying they were “excited to watch her candidacy.” “It’s critical Senator Boxer’s seat stays in the hands of a champion for women and families,” spokesperson Marcy Stech said. Harris is the first major candidate to officially declare her intention to run. Her two biggest potential challengers, billionaire Tom Steyer and former Los Angeles Mayor Antonio Villariagosa, have said they’re considering a bid, but have not yet made anything official. On Wednesday, Rep. Xavier Becerra told reporters in the Capitol that he’s “going to take a very close look at” running. “Obviously, I need to have the process move with due speed,” he said, mentioning the need to discuss a potential bid with his wife. Becerra is one of the most high-profile Latinos in the Democratic Party, which could be a major asset in California, but some observers expect he’ll want to stay in the House where he could one day be speaker. Poll: Kamala Harris for Senate?